I'm listening to Josh Linkner's keynote at SDL Innovate and am trying not to jump up and down, going "ooh ooh, yeah I try to do that!" 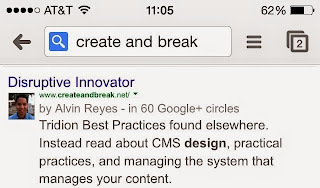 Seven years ago, in 2007, I started Create And Break with the title Innovative Disruptor. I've since "rebranded" as a/the Disruptive Innovator. I'm surprised others haven't claimed a similar title. Maybe I'm a bit presumptuous, but my brand of "creativity" has caused both pain and wins in my personal and work life. So far, it's been a "net" positive and it seems to be only getting better. I had no idea what I was doing then. I think I have a clue today. Who knows what tomorrow brings, but I'll get there by creating and breaking as a disruptive innovator. The first step was a combination of "hey, why not?" and giving myself permission. Give yourself permission to do something creative. Break something.